We offer Daily Drink Specials Sunday through Friday. We offer catering packages groups from 10 to 300 people. Check out our catering menu at www.meatballs.com. Let us bring the warehouse to you! Good place to take kids. Value for price paid is decent. They are always busy. Our server made rude comments a couple of times as she was walking away from the table. Other than that, it was fine. She got the order right, for 22 people that is great. She just didn’t have personality. Mom's 90th birthday. The 16 of us had a great time, a great experience. Open table reservation worked perfectly. Table ready when we arrived. We let server know we had an event after meal. He made sure we were taken care of in a timely matter. Food nice and hot and flavorful. Food and service was great and we received our food very quickly. The photographer was a nice addition to our last visit. Beautiful place but terrible food and very over priced for what you get. All seven people on our table, even the kids disliked their meals. I've been going to this establishment since 1988, and in that span of time I have not had An experience quite as disappointing as this one. Our server was remarkably rude, not timely and looked like she had been drugged out of the alley behind the warehouse cleaned up a little bit and then thrown in as a server. The food was remarkably mediocre, this is the 1st time that I've ever eaten there and had left overs where I threw it in the trash instead of Troubling myself with eating it again. The atmosphere was fantastic as always, and the individual they had taking pictures for the family was very very kind, I can't say enough nice things about the guy. This was a birthday dinner for my girlfriend In her family, and I ended up having to apologize for suggesting a place that was as bad as this. Our food was excellent per usual. You get so much food for your dollar there. Our service was subpar. I think our waitress had too much on her plate and wasn’t as attentive to our table. We got one refill our entire meal and it was when our dessert was brought out. Overall though I would recommend. Great time. Celebrated my wife and daughter's birthdays. Staff was great. So, was the food, as always! Devon was great. We were out at COSI with our young family and decided to eat here. E retrying was good. It all came out in perfect timely fashion. Met with close friends before about of country trip. We had a great time . The food was good. Our server was a little cranky but overall he was attentive to what we needed. Always good. Had our 9-year old with us so he enjoyed sitting in the trolley. His butter noodles were dripping in butter and he was not able to eat them. They were from the child’s menu so I think perhaps a more child friendly version should be considered. Everything else was good. We had a problem with our reservations. We checked in 8 minutes early. It was a crowded night, but we were skipped over. Apparently, we did not get marked as present. We didn't get seated for an hour, after I brought it to their attention. Otherwise, food was good and service was excellent. Best part was the chocolate cake! Service was great! Fast to get everything out to us and the food was amazing! I was disappointed that we made a reservation and yet were sat in the back room that does not have much character and feels like a basement rather than the nicer part. The food is adequate but not special but the service was good. The cool atmosphere is why we go and I was hoping to impress our dinner guests from out of state but couldn't when we were in the back room. Went for date night, enjoyed every minute being there. Family vibes but also a great atmosphere for couples and friends. Food was great and affordable. Pre-made salads and watery spaghetti. Certainly nothing authentic here. The food, the service, the ambiance, and the cool decor of the place just really wanted to make us come back. We truly enjoyed our meal and the atmosphere. Our server, Kyle, was fantastic! Prices were comparative. We look forward to returning to dine there again. Everything was wonderful! The complimentary picture was wonderful! The food had no flavor, it was warm not hot. 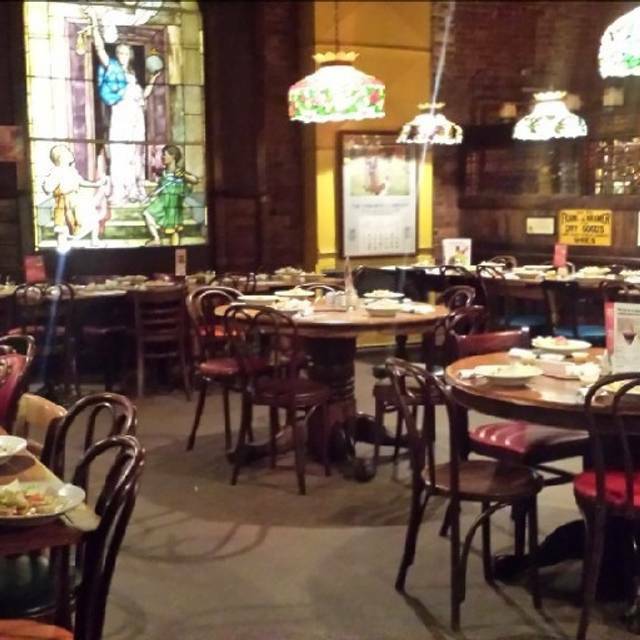 Spaghetti warehouse has lost its quality and charm. I haven’t been in years and was excited but most likely won’t be back due to the food. Made reservations for my kids birthday & asked to sit in the trolley. Service, food & atmosphere was excellent. So much for for all of us- hadn't been since I was a kid and we had an absolute blast. Great place to take kids. Prices very reasonable. Not only was the process of making the reservation made simple but the experience once we got there was great! Would definitely use this feature again for the next larger luncheon. Great Job! Our waiter Bill was great! Full of personality and jokes. Our table was ready as soon as we talked in and was seated right away. Food was great and so was the service. It took about 15 minutes past our reservation time to be seated, but otherwise the dinner was nice. I like this place but the food was not good. Had a weird taste. Place was so dirty I didn’t want to touch anything. Someone needs to dust, vacuum, and clean. Service was excellent! Spaghetti Warehouse has been a family favorite for many years. My husband and I decided to have a much-needed date night in Columbus and chose Spaghetti Warehouse mostly for its proximity to the Ohio Theatre, where we had tickets for a show that weekend. The restaurant is cozy and the ambiance is romantic. The food was delicious and the service was great. We enjoyed ourselves immensely. Awesome service and food! Great place for special dinner with a loved one! Great experience for Valentine’s Day!!! Good food, good service, good value. Waiter was friendly and knowledgeable. Seated promptly . The service was adequate . The food was good but atmosphere was lacking. Parking Lot was somewhat icy to walk on, some of the group thought it was chilly, I did not. It may have been on the other side of the table. Food was excellent and we are good with the decor.